In the early 1880s, W.K. 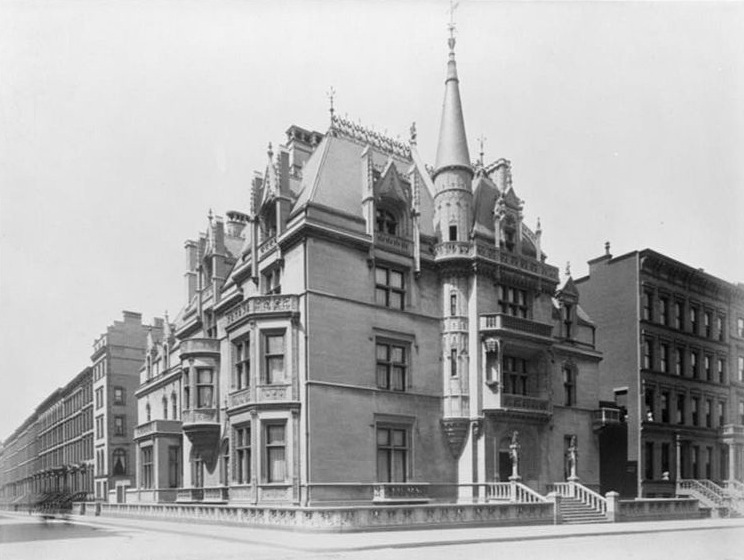 Vanderbilt (grandson of Cornelius) and his wife, Alva, moved into this French Renaissance–style mansion on pristine Fifth Avenue and 52nd Street, near where various Vanderbilts had also constructed luxe gilded-age houses. Alva, who later became a prominent suffragist, helped architect Richard Morris Hunt (he also designed the facade of the Metropolitan Museum of Art) plan it out. She was determined to make her mark on New York’s movers and shakers. Her efforts probably paid off. It’s a pretty impressive home. Sold in 1926 to a real-estate developer, the mansion was demolished and replaced by—no surprise—an office building. This entry was posted on April 22, 2009 at 3:57 am and is filed under Midtown, Music, art, theater. You can follow any responses to this entry through the RSS 2.0 feed. You can leave a response, or trackback from your own site. I am a student of Beaux-Arts Architecture and I thoroughly enjoy all of Richard Morris Hunt’s work. I was wondering if you had any more information about the Alva Vanderbilt NY Chateau (which Hunt designed)? I would certainly like to read more. I have the book, “The Vanderbilts and the Gilded Age: Vanderbilt Houses”. Do you know of any sites or locations where I may find more material about Richard Morris Hunt’s work (especially this one house)? My great grandmother ..I believe was the chief cook for the Vanderbilts at their 660 5th Ave home. Can anyone validate this? Her name was Bridigit Nee Boylan. Dr. Coleen Roberts wants the Vanderbilts to know that my Irish great grandmother, Bridgit Nee Boylan, who was their great grandparents head cook, raised a family of children who worked as producers for NBC, ran the Atlantic City Race Track, and became educators for Gwinnett County Schools. Her grandaughter Muriel Agnes Boylan Shea raised four children and seven grandchildren who all went to college. My great grandmother was the force behind the evolution of a n Irish Catholic family in the USA. Muriel Agnes Boylan’s great grandmother taught all of us the receipts for desserts that were used at the Vanderbilts home on 5th Ave.